This tour is a full-on adventure, a journey taking you to wild places of incomparable beauty. 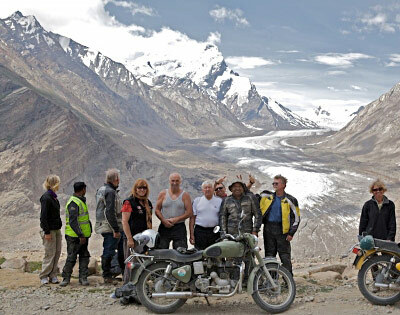 It is also a challenge; a trip to the edge of beyond that takes in several of the planet's highest roads, including Khardung La, the World's highest 'motorable' pass. We will camp beside sparkling high-altitude lakes, cross deserts and scale the high passes to take in lifetime views over the biggest mountain range there is. 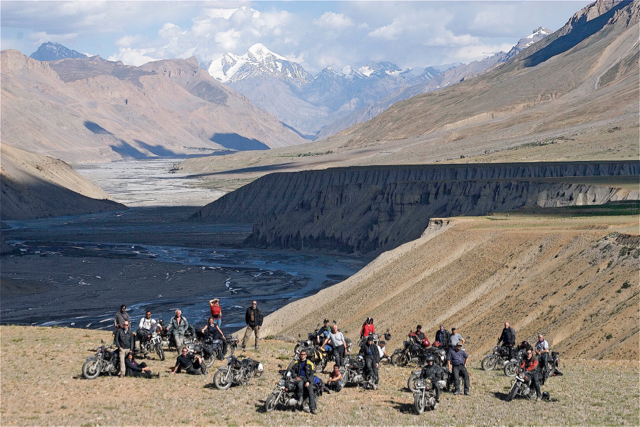 The High Himalaya route also navigates the Spiti Valley. 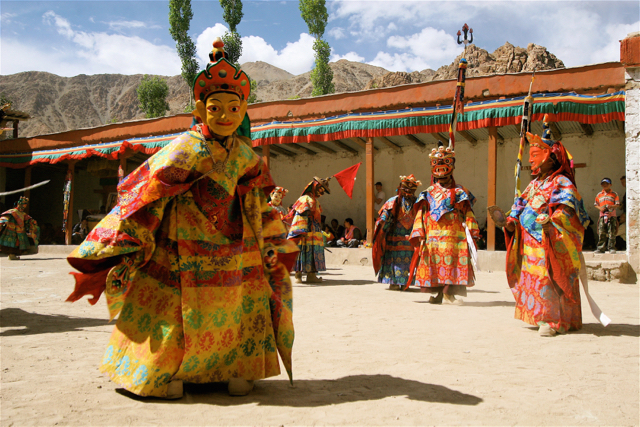 Also known as 'Little Tibet', Spiti is outstandingly beautiful and packed with cultural highlights. Fairytale buddhist monasteries sit among snowcapped mountains below which farmers still till the soil with yak-power. While we do everything within reason to make your trip as safe and enjoyable as we can, there are challenges implicit to travelling in the world's mightiest mountains that we could not remove if we wanted to – it adds to the excitement. The environment is very much in charge here, the natural forces so great that human endeavours to tame them barely register. 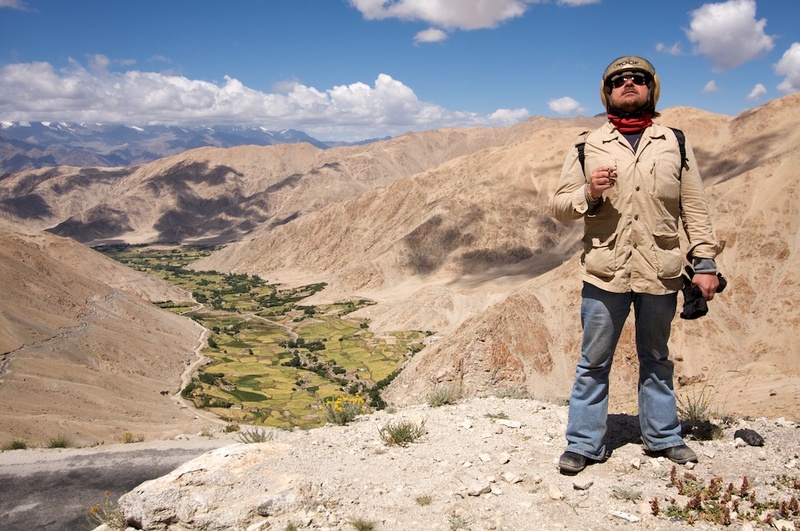 As a participant in this tour you'll fly to Delhi, and transfer to the nearby domestic terminal, where you will board for the spectacular flight up to Ladakh. 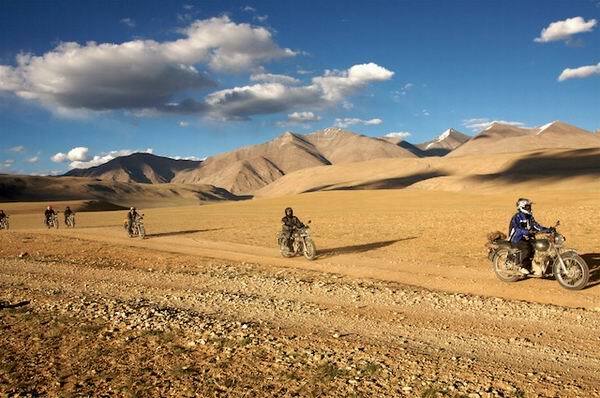 In Leh you will be met by the Blazing Trails staff and be handed 'your' bike, a 500cc Enfield Bullet (with a front disc brake) and given instruction on its eccentricities. There will be a full briefing and a familiarisation ride before we set off into the high mountains. Travelling up in Ladakh by bike brings you close to the environment and its inhabitants; close to the nature of this huge place. For most riders a trip like this will be the experience of a lifetime. Ladakh is a sparsely-populated area of lofty mountains and high desert plains in the Indian Himalaya, part of the state of Jammu and Kashmir. Once a major intersection on the Silk Route, it is now bordered by Chinese-controlled Tibet to the east and Pakistan to the north. Currently all Ladakhi border crossings to these countries are closed. The indigenous population are mainly Buddhist and are culturally Tibetan. They traditionally carved out a tough existence through agriculture and trade, but now the tourist industry also provides income. Ladakh (in winter) is the coldest inhabited place on Earth, after Siberia. The entire region around Ladakh's capital, Leh, is cut off by road from mid-October to late May by snow. Much of Ladakh is situated above 10,000ft in altitude, being part of the Tibetan Plateau (Ladakh is known as 'Little Tibet' and has often been part of that Kingdom). The Great Himalaya to the east provides a rain shadow, beyond which the easterly monsoon should not pass (although very occasionally it seems to). The lack of precipitation means less snowfall than other areas of similar altitude and it is this that has allowed the building of most of the planet's highest roads in this area. Winter temperatures fall as low as –35ºC, but in summertime the climate is mild, ranging from around 30ºC to 15ºC in the daytime and rarely dropping below freezing at night. Hop on the flight to Delhi, where you'll transfer to the domestic flights terminal to connect to your short (approximately one-and-a-half-hour) and stunning flight over the snow-capped mountains to be delivered into Leh, where you will be met by the Blazing Trails staff and transported to our hotel base. 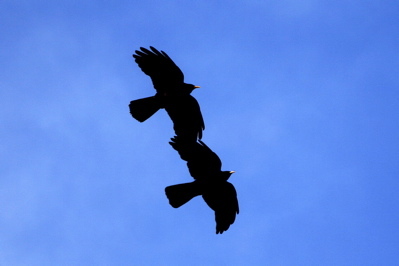 As you've flown in to an altitude of over 11,000ft, a liesurely approach is in order. Take a walk into town to shop, eat and visit the sights. This large, history-drenched town was the capital of the ancient kingdom of Ladakh. It is set at nearly 12,000ft above sea-level in the upper Indus Valley and like all Ladakh its culture is principally Tibetan Buddhist. 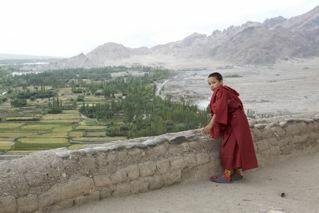 There are also Muslim, Christian and Hindu communities throughout Ladakh. Overlooking town is the nine-storey Leh Palace, long since abandoned, but still impressive. There are many more ancient temples and monasteries to visit and the old Leh market is a fascinating experience. Today we leave Leh for the big one; the climb over Khardung La ('La' meaning 'pass' in Ladakhi), reputed to be the world's highest motorable road. In less than 30 miles the road will carry us around 8000ft upwards. The surfaces are mixed – in some places smooth tarmac, in others potholes and rubble – but the views across to the Kangri Mountains and Zanskar beyond are consistently stunning. The ride down into the Nubra valley, which is around the same altitude as Leh, is no less impressive as the landscape opens up into huge views. More on Nubra Valley. Having explored Nubra, we will (if possible) take a small new road through the most remote of regions. This will carry us onto the Chang Tang Plateau which extends into Tibet. 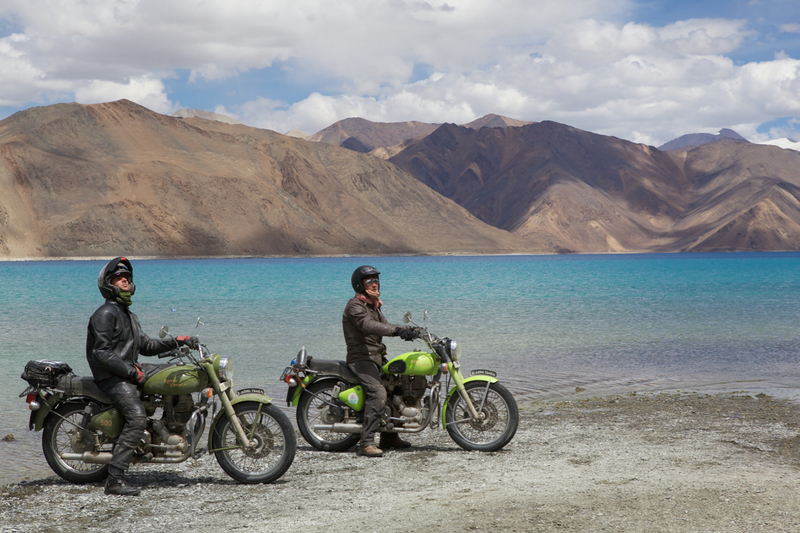 We will ride down the most curvaceous of roads until we reach the bright blue of Pangong Tso, a high altitude salt lake that extends some 70km into Tibet. It is in this spectacular setting, with a backdrop of yellow desert rock and snow-capped mountains reflected in the aquamarine water, that we will stay the night. 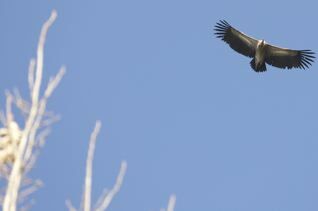 More on Pangong Tso. An early start for a six-hour ride over Chang La, on surprisingly good, curvaceous tarmac. 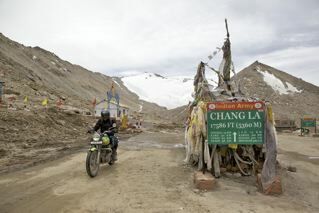 Chang Pass (at 17,500ft) is all but the same height as Khardung. The day ends within the grounds of a historically important Buddhist monastery in the village of Thiksey, which can be explored as the sun goes down. More on Thiksey. The morning is free to explore more of the monastery and surrounding village, or take a well-deserved lie-in. From here to Leh is just a short hop down the main road, so there will be time for any last-minute Ladhaki shopping before dinner. Today we leave the main Manali-Leh road and head for Tso-Kar, a deep blue brackish lake up at 13,780ft, reached via very remote, often unpaved, roads. We will spend the night beside the lake and if the sky is clear, the star-gazing is fantastic. 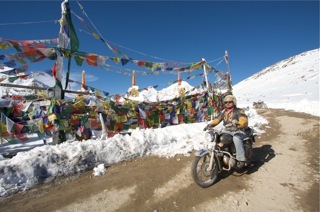 More remote riding over huge scenery and high passes. Leaving the lake we will head back to the highway, which we will join on the vast Mare Plain. At the village of Pang, the road drops off the plain and the regular pattern of up and down, zig and zag, resumes. The highpoint of the day is Lachlung La (16,300ft). Another plain is crossed at Sarchu, situated on the border of Jammu-and-Kashmir and Himachal Pradesh states. Another very high and beautiful pass, Baralacha La (16,040ft), must be crossed before descending for a night in our hotel in the village of Jispa. Today could be tough, but it's always a stunner. 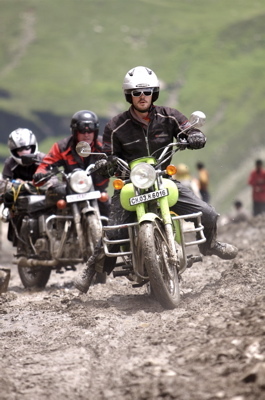 Starting in the magnificant Lahul Valley and ending in the epic Spiti Valley, much of the time is spent on dirt roads in steep-sided valleys. The head of Spiti is crossed at Kunzum Pass (10,050ft) before we follow the Spiti River through a mind-meltingly incredible environment down to Kaza and a good night's sleep. Today we need to do some paperwork, obtaining permits to enter the 'Inner Line' – the area close to Tibet/China. This should be accomplished in the morning and in the afternoon we will take a short and steep ride up to Komic Monastery, one of the highest year-round inhabited places on Earth. Ahhhh, more Spiti. The amazing mountain views and twisty roads just keep coming! Past fairytale mountaintop monasteries, crossing passes and tackling inumerable hairpins, we rub up against the Tibetan border as we make our way south, losing altitude along the way. The night's rest is found in the hilltop town of Kalpa. 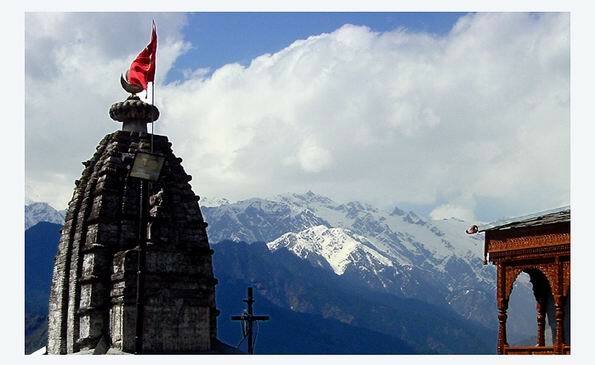 Views over the nearby mountain ranges are stunning and, when the weather is clear, the perfect triangle of Mount Kinnaur Kailash, said to be the summer home of god Shiva, is visible from our hotel. Following the Sutlej Valley downstream, with its amazing cliffs and drop-offs to the river below, this is a shorter day, but usually not without it challenges. At the ride's end, turning from the main road, we will climb the valley-side to the picturesque hilltop village of Sarahan, where a characterful stay is found in an ancient Hindu temple compound. More on Sarahan. After all the high-altitude desert that has gone before, the dense hill-forests will seem all the greener and the air all the denser as the tour heads to what will feel like a teeming metropolis. 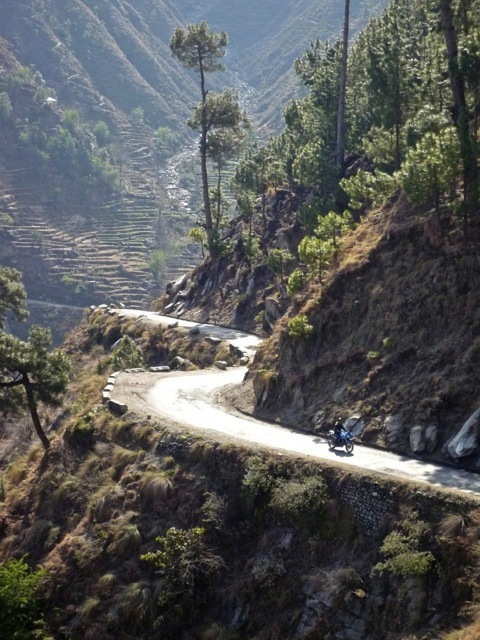 The riding joy does though go on for this final ride, with plenty of twisties on the way to Shimla. The traffic encountered may also be something of a shock after the remote environs through which we have travelled. There should be time for a stroll around historic Shimla (summer capital to the Briitish Raj), before settling to a last night dinner. 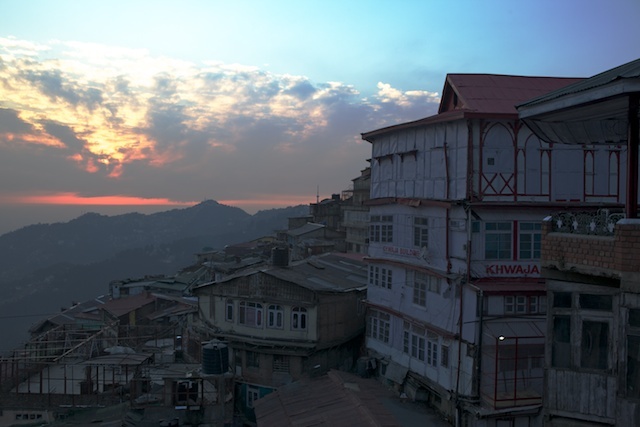 Most of the day can be spent exploring the Raj-era sights of Shimla, before it's back aboard the light railway, this time in the other direction to Kalka. There you will meet the sleeper to Delhi, which will deliver you to the capital to connect with your homeward flight. After coaxing your 1950s-style single-cylinder time machine through scenery that hasn't changed for millennia, the airport (even Delhi airport) will probably appear like a futureshock dream. Then you get to sit in a chair for about nine hours. You will need a passport with valid visa, appropriate travel insurance and an international driving permit. You should be able to get by on around £200 spending money if you don't do a lot of shopping. You may want to change a little money (about £30) at the airport, but check the rate before changing a large amount. Cash and travellers' cheques are easily changed in Manali and Leh (where there are also cashpoints), but nowhere else on the route. Even at high altitudes the Himalaya can be surprisingly warm in summer. But nothing can be taken for granted and although rain is rare there is always the chance of wet weather. When overcast, things can get chilly at night and at the highest points there is a remote possibility of snow. The maximum temperature is likely to be around 30ºC; the minimum 0ºC (rarely, at night). We advise riders to consider their kit in terms of layers. Good quality gear can also prevent a minor spill causing a trip-ruining injury, so we require that you ride with no exposed skin (except your face). Please find more information on bike kit here. While your main luggage will be carried in a support vehicle, you may wish to bring a small rucksack or tankbag in which to carry articles you need on the road. Your main bag must be 'soft' and not a suitcase. Although there is always the chance of getting a 'holiday tummy', following a few simple guidelines keeps the chances of this to a minimum. The tour will be accompanied by a medic with extensive kit to deal with any problem. If you have any pre-existing medical condition, it is essential that you consult both Blazing Trails and your physician before booking. To check out our suggested packing list. Yes, (if you are booking from the UK) all flights, international and domestic are included in the price of your tour. CAN I BOOK FROM OUTSIDE THE UK? Yes. If you are booking from outside the UK, please check the 'Schedules Page' of this site and click on the 'Exclude Flight Price' link. Any problems: contact us. CAN I TAKE A DIFFERENT FLIGHT? You can. Please contact us for details. The tours can be booked online, by email, or over the phone on: +44 (0)5603 666788. To secure a place you will be asked to put down a deposit of �700.00 and payment can be made by card, cheque, or bank transfer. Yes, you need travel insurance to cover you for the period of the tour. This insurance must cover you to ride a bike of the capacity offered on your tour. Recommended by past guests are The Post Office and Tesco, both of whom do reasonably priced policies with the requisite cover. The bikes are insured, so bike insurance need not concern you. How & Where do I get a visa? To visit India you will need a passport (valid for six months from date of entry) and a valid tourist visa. For visits of up to a month's duration it is possible for British citizens (and those of many other countries) to obtain an 'E Tourist Visa' online, HERE. You will need to provide a PDF scan of your passport's first page with a file size between 10 and 300kb. You will also need to provide a scan of a passport picture (as a J-Peg, 10kb-1mb). This picture must be square, on a plain, light-coloured background and without borders. Applicants must submit online between 30 and four days before travelling and the visa will be issued on arrival - on production of an emailed confirmation document. The visa will be valid for 30 days from entry. The fee for an E Tourist visa is currently USD $80 (which is GBP �0). If visiting India for more than 30 days, your passport must also have at least six months validity remaining at time of application. Visas are obtained from the VFS Global (the official agent of the Indian High Commission) offices in either London, Hayes, Birmingham, Manchester, Cardiff, Glasgow, or Edinburgh. All current information on longer Indian visa applications is available on the web at: http://in.vfsglobal.co.uk/. It is possible to apply over-the-counter, or by post. We would recommend the latter and suggest you apply in plenty of time. A tourist visa is usually valid for a maximum of six months from date of issue. Visas for entry to Nepal are available at borders, at a cost of $30 (which is GBP �0), or at the Nepali Consulate in London prior to travelling. The visa application asks for two Indian addresses, what should I put? What other paperwork do I need? You will need a valid certificate of travel insurance and an International Driving Permit. Where do I get an International Driving Permit? Obtain one through the Post Office service, at major branches. All you need is your UK Driving Licence and some six of Her Imperial Majesty's Pounds. We would advise that you have some idea of the Rupee exchange rate before you leave, to avoid getting ripped-off at airports. Sites like this should help. In many major towns, there are cash-points that will accept major credit and debit cards. Arrivals in Cochin for the Kerala Tour will be able to change money in town if the airport rate is not competitive. Goa Airport is rapidly getting a reputation as a den of rip-off merchants and we would advise you not to change money there at present. Money can easily be changed at banks, agencies and be withdrawn from cash-points close to your hotel before we set off. Further advice to this will be given in the tour briefing. Generally if arriving at Delhi, for Himalayan and Rajasthani tours, airport rates should be reasonable and we would advise you to change at least �50. 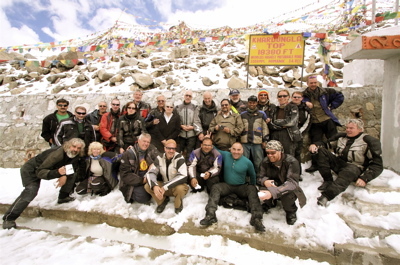 Money can be easily changed in Manali and Leh on the Himalayan tours. Can a lady with a wooden leg change a pound note? No, she's only got half a knicker. About �250 should cover food, drink, petrol and sundries. Yes, unless you pay a supplement. Even then, single rooms may not be available at some stops as the hotels we use are popular, or in some cases small, and we have to book our accommodation some time in advance. What standard is the accommodation? It varies widely, but is always clean and the best we can find in the area for a reasonable price. In some places you may be staying in comfortable tented camps, in others luxury huts or hotel rooms. In Kerala and Rajasthan the accommodation is of a higher standard. There may be nights on the beach or under the desert stars in more remote areas - it's all part of the adventure experience. It can't be guaranteed. In some places there's no power; in all power cuts are possible. Thus, if it's vital you need electrical power every night, please speak to us before booking. Don't forget a travel adaptor if you need to recharge your electricals. what is the difference between tarka dhal and regular dhal? They are very similar, but Tarka dhal is a bit 'otter. How much riding experience do I need? We would recommend only booking a tour with us if you have a full licence (compulsory) and have at least two years' recent riding experience. The main criterion, however, is confidence. If you're happy to zip through a London rush hour, then you'll be capable of dealing with road life in India. Is riding in India dangerous? Riding anywhere carries with it a degree of risk, as does Indian riding. For more information on the riding side of things see 'Riding' in the 'About India ' section of this site. If any rider joining us rides in a manner we suspect will endanger themselves, or others, or indeed displays antisocial behaviour, they will receive one warning. If they continue to display a threat to the safety or enjoyment of others on the tour, they will be excluded from the remainder (with no refund given, see terms and conditions). How fast will we be riding? Due to road conditions and other traffic, vehicles tend to move a lot slower in India than they do in the West. We will do likewise. There are also constraints on speed enforced by the bikes. These are not high-revving sports bikes and so we will lead the tour at a maximum speed of around 70kph. Can I use the bike in the evenings? No, you can't ride independently of the tour group, sorry. Reasonably so, especially for the Himalayas, where roads can be very rough and there is also the matter of altitude to deal with. What's 'reasonably fit'? If you can't jog up stairs without panting, then Indian bike tours probably aren't for you. Can I take a pillion? Yes , but please be sure they know what they're letting themselves in for: some long days in the saddle, bumpy roads and, in the mountains, some pretty shocking drop-offs. We have limited space in our support vehicles, so pillions may not be able to hop off on a whim. Likewise, if riders have any doubt over handling the extra weight, then we'd advise they ride solo. It is possible to book a place in a support vehicle for those who want to join the tour, but not to ride or travel as a pillion passenger. You are limited to 20kg by most airlines. However, we suggest you pack as lightly and in as compact a form as possible. As support vehicle space is tight, we insist you bring soft luggage if you turn up with a suitcase we will ask you to buy a soft bag and repack. Keep it minimal. One set of riding kit for the tour and a couple of sets of clothes for the evening. You can always pick up cheap clothing locally. Isn't India full of snakes? Yes it's full of snakes. Don't bring any snakes. It's full. Do I need a towel? If you're wet, yes. One small travel towel for Goa, Nepal and the Himalayas only. Although most of our hotels provide towels, there may be the occasional night you need your own. Is food included in the price? Only breakfast. You will pay for lunch and dinner, because we prefer that you make your own choices on where you eat and you will find Indian food substantially cheaper than meals at home. I don't like curry, what can I eat? We would firstly suggest that you avoid too much curry, purely on the grounds that you don't like it. Indian cuisine has much more to offer than what we in the West are offered in most 'Indian' restaurants. In many destinations, Western-style food is available and where it is not, less spicy food can be arranged. As an alternative, it is possible to bring your own pre-packed camping meals and add hot water. Is it possible to milk shrews in order to make shrew's cheese? Yes, but it's a very tricky procedure requiring specialist equipment and best left to the experts. Are laundry facilities available on-tour? They are, but not every night. Check the itineraries of Tours you will be able to get clothes cleaned at two-night stops, so consider this when packing. Do I require a pollution mask? Not specifically. Pollution is not a problem except in the major cities, but some roads are dusty so a facemask, snood, or scarf can be useful. Yes. If your riding kit isn't waterproof, then bring some light waterproofs. For the Himalayan tours a light, compact bag will add to your comfort. What medication should I bring & what inoculations are required? Consult your GP/travel clinic for immunisation and malaria advice. Bring enough of any prescribed medication you take regularly. A basic first aid kit is useful (plasters, antiseptic cream, bite/sting relief, plus insect repellent). Any serious medical problems will be dealt with by the tour medic. Should I bring a seat pad? Gel or air pads add comfort on long days in the saddle, but are not necessary. Should I bring a sports bra? If you like. We don't really know you that well yet and so consider your underwear requirements to be your own business. Should I bring a water carrier? As air-fares are so high these days, better to hire one locally, or carry your own water. Packaged drinking water is readily available throughout our routes, which you may wish to transfer into a CamelBak, or similar device. Proper bike gloves are essential. Check this site's information on Clothing Advice for a comprehensive guide to what you'll need. I've read that on your southern tours there will be the opportunity to spot wild 'bison'. Surely the only bison sub-species reside in European and North American populations. Are we being taken for fools? Yes, unfortunately guidebooks and indeed most guides themselves can be short on taxonomical understanding. The 'Indian bison' is properly known as a 'gaur' and is the largest bovine (cow) species. How do I tell the difference between a buffalo and a bison? You can't wash your hands in a buffalo. Should I bring anything else out from England? Oh yes, there are cravings we struggle to meet. We overworked staff, bereft of the comforts of our native environs, have predilections for fine wines and tawny port. To accompany the above we require, nay beg the solace of, fine French cheeses and cured meats, possibly including saucisson (or Italian/Spanish near-equivalents). Actually we're really not that fussy and any decent booze will do, for off-duty amusements only, you understand. Bring such treats and you will be treated as a minor deity (being elevated to a god-like status is not compulsory; omnipotence subject to germs and contritions). Holiday bookings can be made by phone, via email, or over the internet. Contact us by any of the means above. Upon deciding to book, please pay a deposit of £700.00 into our bonded account (or the full balance if within two months of the departure date). This can be done by credit/debit card through our website or over the phone, by bank transfer, by over-the-counter payment, or by sending a cheque to our UK representative. Having booked with Blazing Trails, you will be sent all the necessary information on timings and meeting points. You may also like to use our website, or Facebook group, to liaise with others. PLEASE NOTE: A maximum of one week (seven days) will be allowed for your deposit payment to reach and clear in our bonded account. Should this not happen, we can suspend your booking and may have to give your place on tour to somebody else. This tour requires some endurance, but the riding is largely untechnical. High passes (up to 17,550ft) are likely to be rough at the tops. However, it is achievable to the average rider with a bit of teamwork and effort. A few tough sections for passengers, especially over the top of the high passes. Generally, though, the roads are pretty good (assuming they haven't been recently bombed out by landslides). Breaks in the support vehicle available. The accommodation is the best we can find in the area. Food (mainly vegetarian) is simple, except in Leh, where the tourist industry is more developed. Included meals: all breakfasts; 3 dinners. Otherwise food is extremely inexpensive.